The 24 metre sailing yacht Capricorno has had a further €250,000 price cut with Francesco Vitale from Nauta Yachts, following a €350,000 price drop in October 2014. Designed by Reichel-Pugh, Capricorno was built in GRP by New Zealand yard McConaghy Boats and launched in 1995 as a pure carbon racer. In this incarnation she won the Sydney-Hobart and Cape Town-Rio races. 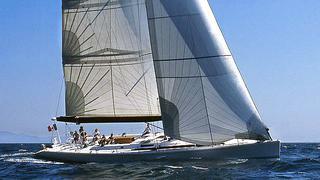 The yacht was then converted into a racer/cruiser in 2005, with new decks and a carbon mast, as well as new interiors fitted out by Indiana Yachting in Italy. She has explored some of the most far-flung regions of the world including Patagonia, Cape Horn, Polynesia and Eastern Australia. In 2013 she had her hull repainted, as well as new carbon standing rigging, and is in excellent condition. The interior accommodates six guests and features an owner’s cabin forward, two guest cabins and a crew cabin. Her single screw 160hp Yanmar engine offers a cruising speed of 10 knots and a top speed of 11 knots.